In-house designer Cardon Webb creates six covers that fit together to form a cutaway view of the human head. A lousy or insipid cover won’t turn me off from reading a good book, but a great wrapper heightens my appreciation of the book as an object. And a superb jacket — one that brilliantly conveys what the book is about in a single compelling image — can be enough to tempt me to buy an additional copy for display. 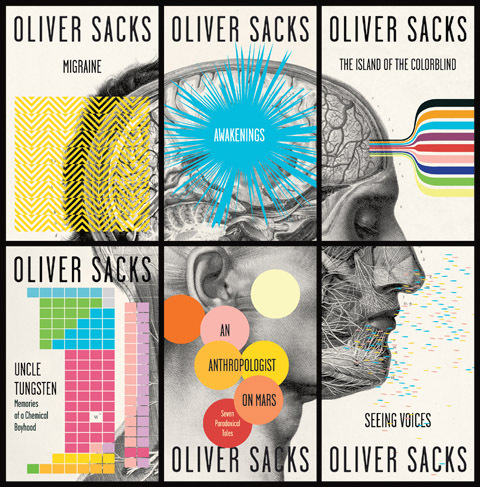 Such is the case with a new series of covers for six Oliver Sacks titles from Vintage Books. Each cover deftly conveys in graphic shorthand the neurological abnormality Sacks describes; arranged together, the jackets form a powerful tableau of a cutaway view of a human head. Check out the slideshow of all the covers, which, like all successful graphic art, speak for themselves. They’re available now on Amazon for $10 each.